Most people do yoga practice for fun, some do it for a purpose while other it because their friends does.In all these, yoga has a way to benefit the body. Below are the importance and health benefits of yoga to yogis, and also to celebrate the International Yoga Day. For yoga beginners who don’t know how to start yoga practicing, this article here will help you. Stress is common to occur in different individuals and at different time. Stress could be caused by thinking of how to solve a problem at home, school or work place. Relaxing yourself with yoga helps to calm your body and spirit. For some yoga poses to help release stress check here. Daily yoga practice can easily make you gain balance when slipped or tripped. Here are some poses to help improve your balance, tree pose, warrior I, warrior II and warrior III. Warrior III is one of the best pose to improve your balance. If not for any other yoga health benefit, do yoga for flexibility. When your muscles are too tight and heavy, you find it difficult work, walk or even lift things. This can make you feel lazy for the day. Flexible muscles make you feel light and ready to move. For beginners, your muscles may feel tight, but will loosen up when you practice yoga often time. All yoga poses helps to strengthens and stretches the muscle. This helps the muscles to loosen up and allows easy flow of blood in the body. You can stretch different muscles with poses that targets the muscle. Strengthened muscles also help to prevent arthritis and ease back pains. Open chest allow blood to flow easily in and out of the heart. Also, opened lungs allow air to move in and out freely in the lungs and can also prevent asthma. Examples of these pose includes camel pose (ustrasana), bow pose (dhanurasana), cobra pose (bhujangasana), cow pose (bitilasana) and fish pose (matsyasana). 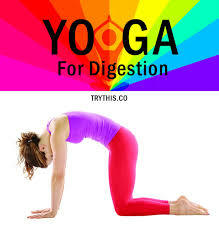 Yoga practice can help improve your digestion and may reduce the effects of Ulcer and irritable bowel syndrome. This claim was only deduced by yogis and has not been scientifically proven. Of course, you should always visit your doctor when you have digestive disorders. Yoga helps to release body and joint pains. Body pains can affect your mood and also makes you dull during the day. Upward facing dog and downward facing dog poses can help release your lower back pain. Apart from practicing yoga during stress to release yourself and feel calm. You can also practice yoga to have peace of mind and be calm. This helps to bind the body, mind and spirit. Example of poses for calmness includes easy pose, baby pose and corpse pose. Do you know yoga can make you be happy and have improve your health in general. Choose yoga poses that makes you find your balance like tree poses and warrior III and sadness can diffuse in to the air in a moment :). Insomnia is one of the leading factor causing weight gain, obesity and overweight. Lack of proper sleep could be as a result of stress and anxiety. Yoga has been found to improve sleep in older individuals. Daily yoga practice can help relieve your stress, makes you sleep deeper and longer. Yoga helps to stretch the connective tissues like ligament and tendons. These tissues connect two bones at joints and helps to prevent friction, fracture and dislocation. When your supporting tissues are well placed, you will have a good posture while standing or sitting. Yogis are always focused during practice and this can also take it into their normal life. Yoga also has the ability to improve one’s intelligence. Deciding to start yoga practice is one thing, and another thing is really putting it to practice. Most individuals starts yoga for a particular purpose and when they don’t achieve their intention in a short time, they quit. It only takes the determined ones to succeed with yoga. As a yogi, you should know that all these benefits may not occur suddenly, they take time to manifest. Just as it takes 12 weeks for a fit person to be noticed, it may take longer time to be noticed as a yogi because yoga is not a vigorous exercise. So don’t be discouraged, roll out your mat and practice yoga. If you have any question, leave it in the comment section and share this information.